The students called for the largest protest they could and now they are going home. I feel curiously empty, though, as though I missed something, but I'm not certain what. It has to end, but has it really? Li Peng is still in power. Has there been any change? What has happened? As many of the students lie ill in their hospital beds, what has changed? What has been accomplished? Something, at least in the minds of the Chinese people, and what a message it is for the world that such an event would happen. That such a mass movement occurred, in a city as large as this, and the students were so disciplined and so organized that the army didn't have to intervene. The city was brought to the brink of chaos, but it never became chaotic and it never crossed that barrier. It is all on the shoulders of the students, all the credit for leading a non-violent movement that they, as well as the world, can and does feel pride in and share in. Back home and snug in bed. I was wrong! Wrong, wrong, wrong. These people are indefatigable—and stubborn as hell. It turns out we—excuse me, they—are marching again tomorrow! This time they are demonstrating to welcome back Wan Li, who just returned tonight from the States. He's been wandering around Canada and the US being very vocal in his support for the student movement and apparently he carries some weight. He's the Chairman of the People's Congress. So, he's back and will add a great deal of strength to Zhao's side—the reformers side. It's still anybody's guess how this is going to turn out. One can't walk in the streets of Beijing for five minutes without wondering how Li Peng is ever going to survive this. He is hated, detested, despised, and many far more descriptive terms in Chinese. CNN reported tonight that the press restrictions are going back into effect at midnight tonight. They've been virtually ignored for the last day and a half, ignored by all concerned, Chinese and foreigners alike. But now the government seems to want to crack down again—perhaps a sign that the conservatives are in the lead again? Holding the reins? It's difficult to find an apt metaphor for the power struggle that is still continuing. I felt sort of let down on the Square today. It's still full of people, still looks and smells like a cesspool, but they've started letting traffic go past, and the alleys on either side aren't roped off anymore. It's just not the same. I feel like an old radical who woke up one morning to find the ’60s were gone! So I was glad to see hundreds of people outside the People's University tonight, even if most of them did, at one time or another, want to occupy the same spot as I did! But what a lively crowd! All listening, talking, discussing what was being broadcast, laughing, clapping—it was fun. This really has brought people together in a way that nothing has in the last 70 years at least! Perhaps more than liberation? Who knows? According to one man, all the universities have organizing committees. And work units as well. 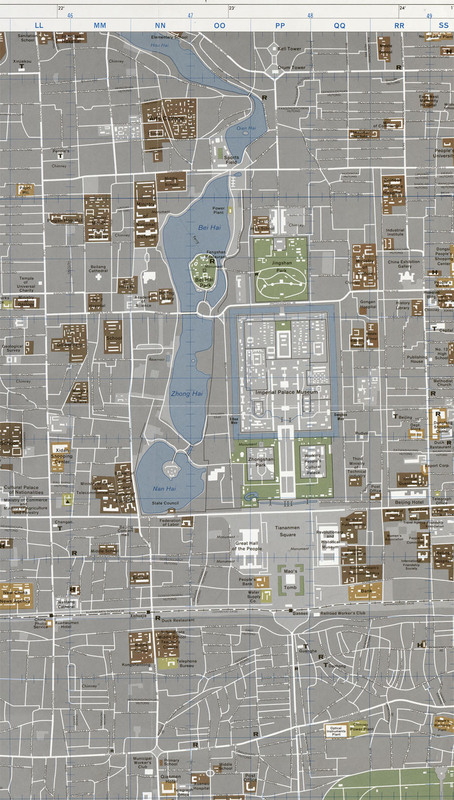 They assign people to different jobs, to coordinate different areas of the city. This man was assigned to one corner. They stopped three army trucks, explained everything to them, and the trucks turned around and went back! Over and over again it was broadcast at the People's University, over 100 hours of (martial law) and still not one single military vehicle has made it into the city (A defiant voice booms out through the broadcast system and is met by clapping and cheering on all sides). The people are EMPOWERED in the most basic, literal meaning of that word. At Tian`an men Square. There’s movement everywhere around me—people—students this time, moving in all directions, preparing for the afternoon’s demonstrations. I was wrong; it is not over, by any stretch of the imagination. In Tian`an men Square, there is an unreal atmosphere. It’s like a city within a city. Thousands of students are here, milling around, standing in what look like never-ending lines for food. They are sitting under tarps, tents, on cots and on the ground, surrounded by piles of clothes and blankets and sleeping bags. As the sun beats down ferociously on the Square, it’s hard to imagine that there could ever be a need for so many blankets. But it’s yet another reminder of just how long the students have occupied Tian`an men Square. As in the larger Beijing, the Square is a model of organization. Schools on each side have their own areas. In several places are makeshift clinics, filled with doctors and nurses tending minor wounds as well as more serious bouts of fever. In the middle, surrounding the monument is another roped-off area. Inside is the area in which the student leaders are camped. They are fiercely guarded and protected by a number of “pickets” as they are called. On one side lies the tent in which the student broadcasters rest and work. This area is equally well guarded. The Square is a mess. Piles of scraps of food and paper lie everywhere. The atmosphere is that of the second or third day of a weekend party. The edge is off, the euphoria over. The heat, the lack of adequate food, the sheer number of people must be getting to them, not to mention the ever-present possibility that the army and its tear-gas may still arrive—at any time. The news this morning was ominous. Li Peng has secured the support of the generals who say that their troops will obey orders. Wan Li has arrived in China, but according to Beijing Radio, he is being kept in Shanghai for “medical treatments.” Beijing Radio was only ten minutes long this morning—world news and China news—without a mention of the current struggle. There is a demonstration going on now, but it’s totally different. It lacks the spirit of previous days. Perhaps it’s the heat, but these people are tired and bored. How long can they keep it up? How long can the government! At least Li Peng probably sleeps at night. I doubt you can say the same about the student leaders. God knows how long it has been since they slept—how long can they last? Back at my room. Okay, I know I’ve said this before, but I think it’s over, and the wrong side has won. It makes me so angry. Li Peng is clearly back in power, and secure. That’s it. This month of movements, demonstrations, outrageous actions perpetrated by the people, all to waste. Or so it seems. But it all seems so predictable. Now Li Peng is in power, firmly in power the first thing he will do is purge the universities of all the students who were active in the movement. No doubt purge a number of workers, leaders of the various units as well, and clamp down the doors again. This is the worst possible thing that could happen to China right now. Ten years of opening to the world stand on the verge of collapsing, all to further the careers of the men in power. I’m back in my room and am more angry and depressed than I can ever remember being. Angry, depressed and overwhelmingly frustrated. How can the government be so stupid? To squander away a generation of motivated, keen and aware young minds. To squash them back into subservience and oppress them. They were closing up shop at Tian`an men today. I rode past this morning and all the buses were gone, except one. One lone bus covered in graffiti, looking like it might never move again. The flags were still waving. Students were still camped out—at least 20,000 according to one source, but it’s not the same. The Beijing students are all gone. Many have gone home. The student leaders have “disappeared,” but it’s not known whether it was of their own volition or not. It’s over. Really over. Of course it will take months of shuffling around before things get themselves sorted out, but everything else is gone. The euphoria is gone from the streets—the feeling of togetherness—of the whole city of Beijing working together as one—it’s all gone. Life—disparate, separated life has resumed. It is sad. Things are getting bad everywhere. In the little microcosm of my universe, my room, everything is in complete chaos at the moment, and it makes me too depressed to do anything. I get up, throw two or three pieces of paper away, run out of things to do, become overwhelmed, and I just have to sit back down again. It’s not that there’s nothing to do. It’s just completely unapproachable. Where do I begin? On the Square on my last day in China. But is it the student’s last day? The Square is full—full of students, people milling about. In the middle of the Square is a new site—a statue—all in white. From appearances it looks like it’s made of paper mache. The figure is of a woman—with hands raised up to the sky, clapped together in defiance, holding a torch. But, again, it’s not over. Some students are leaving the Square, but not many. They are staying! They are defying the government and vowing to stay on. Everyone has come down to the Square to see the Statue. Of course the government is up-in-arms, once again, and telling the students to take it down. As they said on the radio this morning, “Tian`an men is a respectable, solemn place, a memorial for those who died in the war and for Sun Yat Sen. People are not allowed to put statues up without permission,” etc. A solemn place! A memorial! The place is a cross between a rock concert, a campground, and a garbage heap! Gone is the solemn, stable, Tian`an men Square, yet it still may be the spiritual heart of the country, but it’s certainly not what the government wants to think it is. Part One of this diary (Apr. 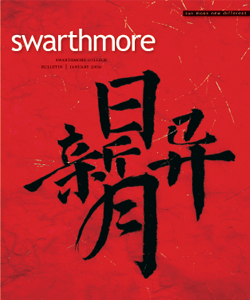 22 to May 23) was published in the January 2009 issue of the Swarthmore College Bulletin. It can be found online by clicking the following link: Tian 'an men Diary. Click here to read an unedited PDF transcription of the entire diary, as written in 1989.